Volcanoes, ancient civilizations, destruction and preservation. Pompeii: The Exhibition, on view at Pacific Science Center until May 25, will give your family lots to think think about and discuss. A walk through the halls might inspire an interest in ancient cultures; provide the humbling realization that societies are not eternal; or motivate a hike at Mt. St. Helens. The exhibition describes life in the ancient city of Pompeii and the devastating eruption that preserved it forever under layers and layers of ash and pumice. The traveling exhibit was created by Arts and Exhibitions International LLC, who also created Tutankhamun: The Golden King and Great Pharaohs, which was on display at the Pacific Science Center in 2012. Pompeii The Exhibition opened February 7; Seattle is its final North American stop. As you'll see in our review, the exhibit is best suited for older kids and teens, ideally with some preparation beforehand. Enter the exhibit via a theater room and a short introductory video full of colorful reconstructions of life in Pompeii. Exotic music and sounds of the sea enhance the feelings of immersion and time travel. The next few rooms display more than 150 miraculously preserved artifacts and present a vision of daily life in Pompeii in the year 79 A.D. The artifacts range from simple objects such as silver cups and colored glassware to statues, frescoes and jewelry. My 12-year-old’s favorite objects in the whole exhibit were the small statues of Roman Gods in the very first room “because they were made by people who actually worshiped them.” Other artifacts appealing to kids include a little garden statue of four puppies curled up in a ball, a few awesome geometric tile designs, snake jewelry and a big ship’s anchor. Surprisingly, the text accompanying the exhibit is at times more kid-friendly than the central glass cases of artifacts. 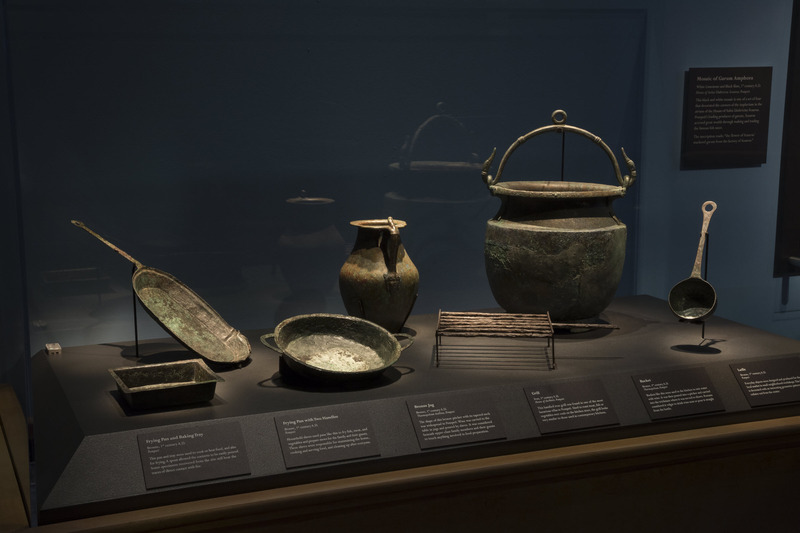 "The Streets of Pompeii" and "Marketplace" galleries contain panels with simple and engaging descriptions of the way bread was made and eaten; the variety of bars and restaurants in town; spices used for cooking; fancy terms related to public baths; and more. The highlight of the exhibit for many kids may be the small corner dedicated to gladiators. The gladiator helmet and armor are beautifully crafted and another nice plaque describes the challenging life of a gladiator. Standing in front of a 2000-year-old helmet, you might wonder, “Who wore this and what was his life in Pompeii really like?” "How many battles did he fight before Vesuvius erupted?" After the gladiators, you have to make a decision: Observe artifacts from a brothel and learn about the prominence of erotica in ancient Pompeii or take the bypass? You’ll come to a wall with a very clearly marked sign. Turn left to skip over adult content; turn right to view a 2000-year-old business where “love could be had for money” as the short film clip so tactfully phrases it. Now take the exciting walk up the long ramp to Mt. Vesuvius. 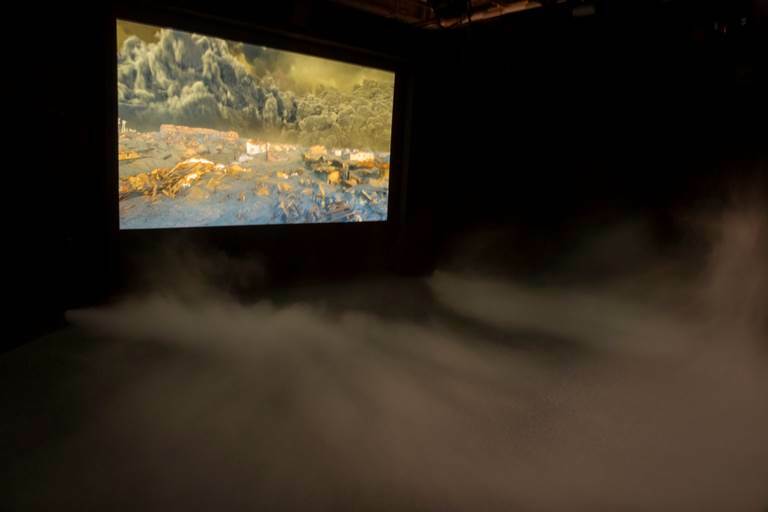 The five-minute film reconstruction of the eruption will be another kid highlight! The film ticks off the hours of the day that Pompeii was buried alive. There are no depictions of lives lost but there is smoke, raining rubble, fire, and devastation. Although the floor shakes and there are some sensory surprises, it was not quite the immersion experience either my daughter or I was anticipating. That said, I have found myself thinking about images from the film fairly constantly since the experience. It’s hard to predict whether young kids would be enthralled or terrified. Parents should probably be prepared for either possibility. Beyond the gift shop, you’ll find a neat display about our local volcanoes and emergency preparedness. Although the exhibit displays the science of seismology, it doesn’t do as much as some parents may need to relieve children’s fears. Hopefully, it inspires some families to get out and visit Mt. Rainier or Mt. St. Helens. There is an engaging, hands-on “Make your own Volcano” computer simulation for kids ready to participate and push buttons. Challenging topics are a core of this exhibit. Many kids will be interested in an ancient civilization brought to life and by the science of volcanos. Many may also be sad for the loss. Most kids, even unflappable teens, will need preparation and follow-up discussions to manage the reality of natural disasters and lives destroyed. The "Know Before You Go" section below provides a quick set of facts to get the conversation started and resources for more in-depth exploration. To help your kids make the most of it, you might want to study up on gladiators and Roman mythology. Ask your kids to look for ways that Ancient Pompeii is similar to modern-day Seattle or to consider the life a child their age living in Pompeii. Preparing a timeline might even help adults gain perspective. This is particularly true if you view the companion IMAX movie, Greece: Secrets of the Past. When: Pompeii: The Exhibition is at the Pacific Science Center through May 25, 2015. The Pacific Science Center is open daily from 10 a.m.–5 p.m. on weekdays and from 10 a.m.–6 p.m. on weekends. Tickets: Adult tickets for Pompeii: The Exhibition are $32; kids ages 3–5 are $20; and youth ages 6–15 years are $23. Seniors are $30. The audio guide is an additional $6 per person. Advance tickets are recommended, especially for busy periods, and there is an additional online ticketing fee of $4 per ticket. Buy online tickets here. 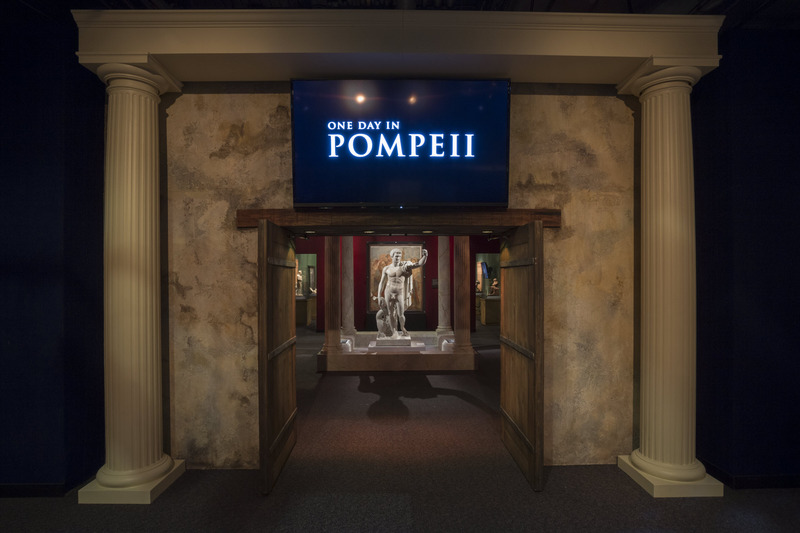 Discounts are available on weekdays, for groups, for members of the Pacific Science Center, and for purchase of simultaneous admission to Pompeii: The Exhibition and the companion IMAX movie, Greece: Secrets of the Past. Age recommendations: Although the exhibit is largely aimed at adults, it may be particularly engaging to teens because of the powerful themes and impressive imagery. Middle school-age kids with preparation will find lots to enjoy but they’ll need a bit of guidance to encourage them to slow down, read, and think. Children in elementary school and younger will likely need parental help to focus their attention on relevant details of the exhibit and to process and understand what they experience. See the Pacific Science Center educator's guide for complete details on the exhibit and what you might expect. Rules: Running, touching, chewing gum, and the use of ink pens or large notebooks (bigger than 8.5x11”) are not allowed at the exhibit. No flash photography either. Note that although the cases containing the human plaster casts are open at the top, kids are not allowed to reach in and touch. It’s tempting. Wheels: Single strollers are allowed and the exhibit is wheelchair accessible. Kids need a foundation of knowledge to give context for new ideas. In the case of Pompeii, there is destruction and sadness as well as mystery and awe. Help your kids be prepared by telling them a bit about Pompeii and the exhibit before you go. Mt. Vesuvius is a stratovolcano. Stratovolcanoes are steep and cone-shaped because they are built up from from layers of hardened lava, ash and stone that has poured out, cooled and hardened. Mt. Rainier and Mt. St. Helens are stratovolcanoes, too. When Mt. Vesuvius erupted in the year 79 AD, it buried the city of Pompeii and approximately 2,000 of its inhabitants under 13 to 20 feet of ash and pumice. Because the volcanic ash was so thick, it blocked out air and moisture, preserving a moment of daily life for nearly 2000 years. Students of all ages might want to read Pompeii: Lost and Found, by Mary Pope Osborne. It’s targeted toward elementary-age students but it provides a quick and entertaining foundation of knowledge. No one knew Pompeii was there for well over 1,000 years. It was discovered in 1748 by workers building a palace for King Charles III. Find more fun facts about Pompeii on this page. Digging into the volcano aspect of this exhibit could be a great way to engage kids who are less excited about archeology and artifacts than about natural disasters, dust plumes and oozing lava. 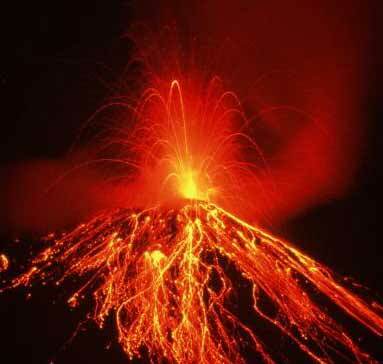 Before the eruption of Mt Vesuvius in 79 AD, the word for volcano had not been invented. The word stems from “Vulcan,” the Roman God of Fire. The biggest volcano in our solar system is actually on Mars. There are so many volcanos on one of Jupiter’s moons that its surface is constantly changing from the activity. We don’t have any active volcanos on our moon but there are many volcanos deep under our ocean! Washington State History museum currently has an exhibit about Volcanoes in Washington State that might be a good companion exhibit to Pompeii. For more impressive volcano facts, visit this volcano page on Science Kids or check your local library’s juvenile non-fiction section. The Pacific Science Center has a nice educator’s guide on the Pompeii exhibit that can be a resource for parents as well. It contains reading lists for various ages, web resources, a plaster craft activity, and a fun way to explore Pompeii using Google Earth.